Plan a drinking party theme as your next adult party theme. Having a theme can switch things up from the usual casual get-together while everyone enjoys relaxing with friends. In addition to serving some good party drinks, it is important to have water and some good food available for your guests. This will help slow down their alcohol intake and keep people from becoming overly inebriated. Once you have your precautions set up, it is time to get down and party. Around the World: Have different rooms or areas set up that have a theme from a different country. Offer sample-sized drinks of liquors, beers and wines from each area to guests. Play a mixed music list that features artists from each country, and offer guests small favors representing each country as they make the rounds. In fact, you could even make up a faux passport for everyone to get stamped as they sample drinks at each country's station. U.S. Destinations: Similar to the Around the World theme, this theme involves serving drinks named after places in the United States. For example, an Alabama Slammer and Long Island Iced Tea are two drinks to include. Hang up postcards and photos from each drink's destination. Colorific Coolers: Simply pick out a favorite color and serve alcohol only that color. This is a theme that is easily adapted to many holidays and seasons. Pick up some streamers, plastic tableware and some balloons in the featured color. If you have the inclination, swap out a few regular light bulbs for ones in the same color as your theme. Olympic Antics: A drinking theme party with athletic feats usually works best in the summer when you can set up an obstacle course in the backyard. However, a winter Olympics is also fun for adults. Plan to have a jump rope contest, sack races, three-legged races, a team snowball fight and more. Serve special top-shelf cocktails to the winners and have some cheap wine in a box for the losers. Paradise Island: This theme is a spin-off of a typical luau party. Hand out grass skirts, play island music, and serve plenty of margaritas, pina coladas and Bahama mamas to everyone in attendance. Pick up some plastic coconut glasses from a party supply store and accent them with umbrellas. Host a limbo contest once everyone is loosened up. 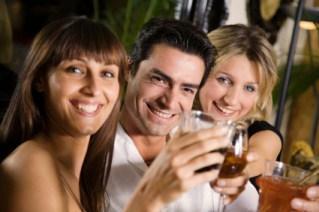 If you want to host a drinking party without the focus on overindulging, consider hosting a wine tasting party theme. Have several different wines on hand, from red to white to blush, in dry to dessert varieties. Look up information on each wine and the winery it was produced at, and give your guests a brief introduction before allowing everyone to have a taste. Have plenty of water and appetizers to cleanse the palate between drinks. Raunchy drinking party themes are commonly touted as great themes. Whether or not you choose to host a bawdy party is up to you, but keep in mind that it may get out of hand quickly and potentially sully your reputation. Carefully consider the consequences before planning this sort of theme for your party.